Alan Bigelow's Ten Predictions about Digital Literature. My favorite is #4: "Most everyone will accept that finding a Joyce, Beckett, or Faulkner in the world of digital literature might take as long as it did in the world of print, and considering the radical differences in these forms, that any such search is probably bogus to begin with." Most of Bigelow's predictions seem to me less predictive of the future, and more descriptive of the present. Which is maybe a good sign? Noah Wardrip-Fruin has posted his DiGRA paper on agency in digital media, co-authored with Michael Mateas, Steven Dow and Serdar Sali. It revisits Janet Murray's 1998 definition of agency as "the satisfying power to take meaningful action and see the results of our decisions and choices," as well as its subsequent refinements by Doug Church, Mateas and Wardrip-Fruin. Agency is not simply "free will" or "being able to do anything." It is interacting with a system that suggests possibilities through the representation of a fictional world and the presentation of a set of materials for action. Designing experiences toward the satisfactions of agency involves balancing the dramatic probabilities of the world with the actions it supports. In other words, the design task is to entice players to desires the game can satisfy — whether this is traveling across space, managing resources, engaging in battle, or making conversational moves. I've got a lot more to say on this topic as it relates to the early modern reader-driven poems I researched for my Masters thesis; but it will have to wait for another post. Not exactly "early modern," here's a digital poem from 1966 -- "Poemfield No. 2," by Stan VanDerBeek / Kenneth Knowlton. 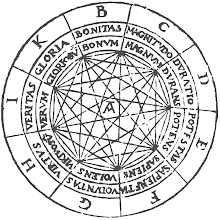 During the Renaissance, a period of 'rebirth' for humanities and science, new knowledge and speculation began to emerge about the function of the human body, replacing ancient religious and philosophical dogma. The brain must have been a fascinating mystery to a Renaissance artist, but some speculation existed at that time on the function of its parts. Here we show how revived interest in anatomy and life sciences may have influenced the figurative work of Italian and Flemish masters, such as Rafael, Michelangelo and David. ... We have several examples of hidden symbolism in Renaissance paintings, but the influence of phrenology and this rudimentary knowledge of neuroanatomy on artists of that period is under-recognized. The authors admit that "in the absence of documentary or scientific evidence as to the real intentions of these painters, the notion of such commixture of sacred and profane remains speculative and probably controversial." A better word might be "coincidental." To me, this is dumb. But whatever keeps docs entertained.